Playing tips - Pokes "A" - "F". Part 3 - Snapshot Pack VI. Part 4 - The ritman interview. Part 6 - Emulator reviews. Part 7 - Faster than basic. Part 8 - 16/48 Index (Part 1). Part 9 - A-Z Of Spectrum games reviews (part 6). Part 10 - Spectrum on the Net. Part 12 - Past, present and future. Part 4 - Haven't i seen you before? 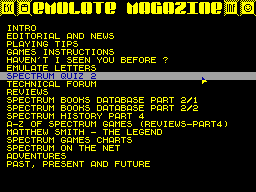 Part 6 - Spectrum quiz II. Part 9 - Spectrum books database (part 2). Part 10 - Spectrum history (part 4). Part 11 - A-Z Of Spectrum games reviews (part 4). Part 12 - Matthew smith - the legend. Part 16 - Past, present and future. Part 3 - Free games instructions. Part 4 - Games that make you jump? Part 5 - Emulate quiz. Part 8 - Spectrum books database (part 1). Part 9 - Spectrum games charts. Part 11 - Spectrum history (part 3). Part 12 - Spectrum on the Net. Part 14 - Past,present and future. Part 4 - Emulate technical. Part 6 - Hacking guide. Part 7 - Spectrum history (part 2). Part 8 - Desert island disks. Part 9 - October games charts. Part 10 - A-Z Of Spectrum games reviews (part 2). Part 11 - Spectrum on the Net. Part 4 - Adventure games. Part 5 - Rebel Star. Part 6 - The Dizzy story. Part 7 - Spectrum history. Part 8 - Spectrum on the Net. Part 9 - September games charts. 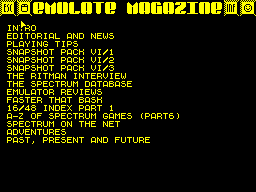 Part 10 - A-Z Of Spectrum games reviews. Part 11 - Next month.